In a nut shell, there is a ‘nut-shell’ around Mother Earth; a grid surrounding Her. You and I can connect with this Grid anytime we so choose. 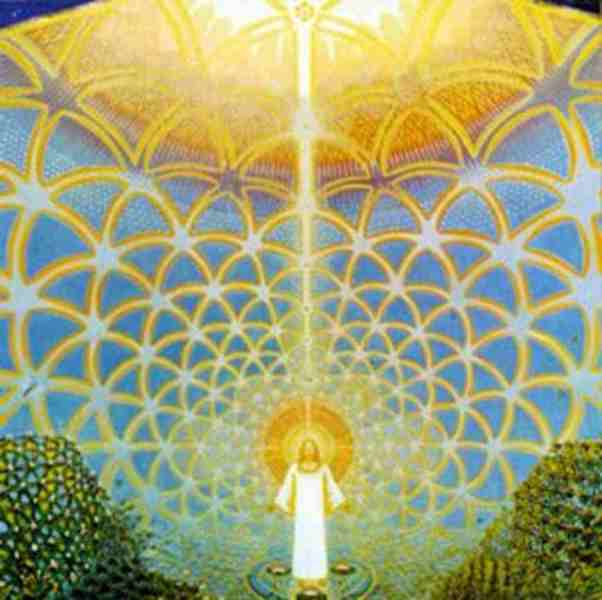 This grid is known as the Christ Consciousness Grid and when we make this connection to the Christ Consciousness Grid we are tapping into the Love from which we are all manifested; we are tapping into eternal consciousness. 2) There is no right or wrong way to do this. What I am suggesting works for me but you may come up with a better idea of how to connect. Honour your wisdom. The first time I connected with the CCG I visualized my prana tube extending straight upwards until it connected with one of the many intersections of the grid (where grid lines meet). I envisioned the energy of the grid flowing down into my own energy field and healing me. The second time, and every time since, I saw myself as a huge tree. (Those of you who know me well know I have a strong affinity for trees.) I saw myself tree-self growing upwards until my branches reached the grid where each branch connected to a different intersection. I felt the energy much more strongly with this visualization. At this point I felt both my mind and my heart open to receiving the grid’s energy and saw it flowing into me as a deep golden colour that permeated every bit of my energy field. I was guided to ask the Golden Light to reset my complete energy field, – physical, mental, emotional and spiritual – to its original ‘Light Dream Blueprint’. Although not exactly sure what the Light Dream Blueprint was, I trusted the message and opened myself up for the golden energy to heal me. I did this by feeling and seeing the energy recharging and harmonizing my biophotons, the trillions of tiny flickers of Light that comprise my total make-up. I also heard and felt very beautiful music at this point in the meditation. I find this to be a great and restorative meditation every time I do it. I hope and believe you will too. You can use this exercise/meditation as you wish, giving yourself an overall healing or focusing on specific areas. For example, my left knee flairs up periodically, revealing feelings of unworthiness. This meditation heals that pain.